Open any page in A Table in the Tarn and you’re likely to be seduced. I got stuck in the Deserts, Petits Four and Chocolates chapter, with recipes for Blackcurrant Leaf Sorbet, Home-Made Vanilla Marshmallows and Cocoa-Nib Florentines but, once I tore myself away from the sweet things, there was much more to recommend this memoir-style cookbook. A former editor of the BBC’s Good Food and Olive Magazines, Orlando Murrin, together with his partner Peter Steggall, abandoned the hurly burly of London life to reclocate to the South-West of France. The first chunk of the book tells the tale of their buying the rundown Le Manoir de Raynaudes in the Tarn countryside and renovating it, followed by five chapters of recipes ranging from Parmesan, Nigella and Sesame Bites and Caramelised Potatoes through Tart Tatin of Chicory and Twice Baked Garlic Soufflés. The emphasis is on food that is both seasonal and local. There are many dishes that can be prepared ahead and are easy to cook for crowds. Tips on presentation at the end of recipes are thoughtful without being too faffy, the Baking, Tea and Breakfast chapter is first class and there is a selection of particularly good potato recipes. As befits his background, Orlando is very strong on timings and temperatures, including settings for the fan ovens that many of us are inflicted with. A Table in the Tarn is rather like an upmarket brochure for what Orlando calls “a reassuringly expensive” boutique hotel in France, with lots of gardening information – and plenty of pragmatic advice for those who may find themselves similarly tempted. However, it is also an absorbing and inspiring read, with recipes aplenty to try in your own kitchen. Maybe on our next trip to France there’ll have to be a visit, Raynaudes-direction. 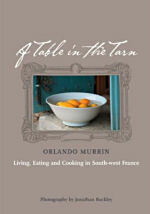 A Table in the Tarn by Orlando Murrin is published by HarperNonFiction. Are they good? I really liked that recipe but haven’t yet got around to trying it. The book always makes me thing of wine in the sunshine, for some reason! I’m convinced and am about to order it! I kept thinking of you while reading it, Martin! Hope you enjoy the book. Next story The first egg!